Your Minneapolis-St. Paul exterior remodeling experts. To schedule a replacement gutter estimate, just call 763-557-1808, or contact us. Metro Siding serves the greater Twin Cities of Minneapolis-St. Paul. To schedule a replacement gutter estimate, just call 763-557-1808, or contact us. Looking for a Twin Cities replacement gutter company? All gutter replacement contractors are not alike. The product and installation experts at MetroSiding will help you understand different gutter materials and options. Our company will help you compare brands and make a smart decision based on what matters most to you: durability, appearance (style, color, finish), warranty, and price. Ask us about Alcoa Leaf Relief; The gutter protection system with a 10 year NO CLOG Guarantee! 3-year warranty on labor. Our three full-time gutter installation crews are some of the best in the Twin Cities. So good, in fact, that we guarantee workmanship for 3 years. Our employees are licensed, bonded, insured. 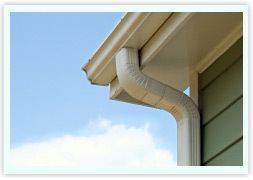 We do not use sub-contractors for gutter and downspout installation. Neat and Careful. Our expert gutter crews take care to protect plants and landscaping during installation and clean up the site at the end of every day. Fast Installation. Gutters for an average size home can be done in less than a day, at an average cost of $650 - 800. A dedicated gutter manager is available to answer your questions, before, during and after installation. Seamless aluminum gutters provide excellent value for the money and are the best choice for durability, performance, range of colors, and lasting good looks. Aluminum gutters and downspouts are less costly than copper, appropriate for many different architectural-styles, and much more durable than vinyl. Gutter Durability. A good-quality aluminum gutter can last 25 years or more - top brands are guaranteed for life against fading, peeling, and chipping. Still, you must make sure your home is properly insulated to prevent damage to your gutters. Even the best gutters are not designed to withstand excessive ice buildup and ice dams due to heat leaking from the roof and eaves. Gutter Performance. Unlike old-fashioned gutters that are pieced together, seamless aluminum gutters will not leak. Aluminum gutters expand and contract as the temperature changes, so they won't crack or break like vinyl. Range of colors. Choose from an array of standard colors. Most homeowners find that a standard color that works with the exterior colors of their home. Custom colors are also available (add 45% to 60%). Nearly 90% of all maintenance-free stet siding can be color-matched. Year-round installation. Gutters and downspouts can be installed year-round, even in winter. Scheduling is easiest during the off-season - January through March. Repair or Replace? If your gutters have become an eyesore, are leaking, or are pulling away from the eaves, then it's probably time to replace them. In addition to decreasing the curb appeal of your home, decaying gutters can create safety concerns, especially ice on sidewalks from leakage. Typically, MetroSiding does not repair gutters because the system would have unnecessary seams (possible leaks) and the colors will not match. Beware of Vinyl Gutters. Vinyl gutters are meant for warm climates and will crack and break in the cold. We do not install vinyl gutter systems because they are unsuitable for Minnesota's climate. Yes, they are very inexpensive - but they will not last, and you'll end up paying more for your gutters in the long run. We install replacement gutters and downspouts designed to perform in Minnesota's demanding climate. We also install copper gutters and downspouts. For quality gutters, great service, and expert installation, contact us today!